The leading companies operating in the active pharmaceutical ingredients (API) market are Zhejiang NHU Co., Ltd., Teva Pharmaceutical Industries Ltd., Zhejiang Medicine Co., Ltd., Northeast Pharmaceutical Group Co., Ltd., and North China Pharmaceutical Group Corp. and they accounted for the major combined share in 2015. Transparency Market Research (TMR) observes that the top players are opting for strategic mergers and acquisitions to consolidate their shares. The presence of significant barriers to exit and high fixed costs incurred by companies have intensified the competitive landscape in the market. In order to cut down manufacturing costs, a growing number of pharmaceutical companies, especially in Europe and North America, prefer to outsource manufacturing overseas. These companies which previously had manufacturing units in their home countries are increasingly shifting to regions with cheap availability of labor and raw materials. However, these APIs are subject to stringent regulations of the countries where the pharmaceutical companies are housed. In addition, several players are focusing on research and development activities to develop innovative formulations, notes TMR. The opportunity in the global active pharmaceutical ingredient market stood at US$134.70 bn in 2015. Rising at a CAGR of 6.3% from 2015 to 2023, the market is expected to reach a valuation of US$219.60 bn by the end of 2023. Geographically, North America is the leading market as it accounted for a major share in the global market in 2015. The dominance of this regional market is attributed to the large presence of pharmaceutical companies which require premium quality of APIs. However, in the coming years, Asia Pacific is fast emerging as the major hub for API sourcing driven by cost reduction in manufacturing. Based on therapeutic areas, the cardiovascular disorders segment dominates the market and is projected to expand at a CAGR of 6.63% from 2015 to 2023. The growing prevalence of various cardiac conditions with complicated etiology is expected to boost the active pharmaceutical ingredient market through the forecast period. A number of blockbuster drugs going off-patents is further expected to stimulate the demand for APIs. 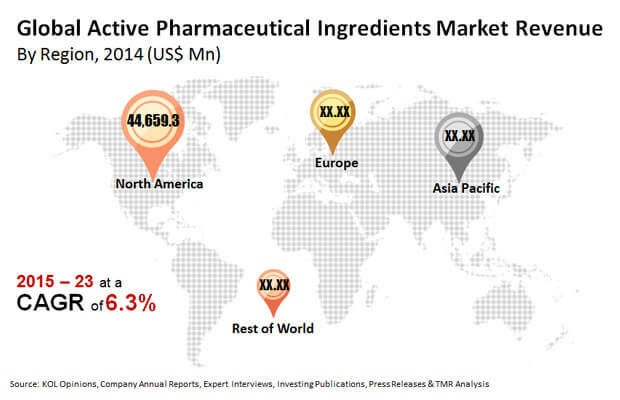 The active pharmaceutical ingredient market is majorly driven by the growing prevalence of a variety of chronic conditions such as cancer, cardiovascular disorders, metabolic disorders, and neurological disorders. Increasing incidence of these diseases has propelled the demand for therapeutics and novel therapies. This has spurred research in drug formulation for more efficacious treatments. In addition, the rapidly growing geriatric population, especially in developed regions of North America and Europe, is expected to stimulate the demand for APIs in making therapies for various ailments. Improving access to quality healthcare in developing regions such as Asia Pacific has propelled the demand for APIs in these regions. In addition, investment by API manufacturers in Asia to adhere to the regulatory compliance requirements, coupled with the tightening regulations by the U.S. FDA on the efficacy of APIs, is expected to boost the global market. However, the growing popularity of generic drugs in developing and resource-poor nations is expected to affect the profit margins of API manufacturers. Nevertheless, various regulatory agencies are working actively to address these concerns, which is expected to unlock exciting opportunities for market players. Substantial spending by various pharmaceutical companies to bolster capacity of API production are also likely to create new opportunities in the market.